Subject: Parahawking is a film about the fusion of paragliding and falconry. It was filmed in Nepal over a period of two years. 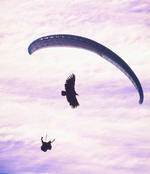 The film records the process of training 2 birds of prey to fly with paragliders.